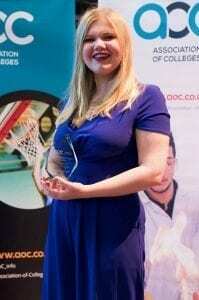 One of Nelson and Colne College’s ‘Class of 2017’ stars who overcame adversity to achieve at A Level has been named as the Association of Colleges’ Young Student of the Year. 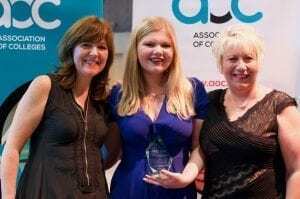 Sophie Ainsworth, 18, was presented with the prestigious national prize by the BBC’s Steph McGovern at the AoC Annual Conference Awards at Birmingham ICC on Tuesday night. It is the second successive year a Nelson and Colne College student has won the award after Lotte Gleeson, who is now reading Physics at the University of Oxford, scooped the accolade in 2016. Remarkably, this is also the first time a student from the same college has won the prestigious prize in consecutive years. Former Bowland High School student Sophie, from West Bradford, overcame illness to achieve A*AB in English Literature, Film Studies and History at A Level and is now at Durham University studying English Literature. Sophie suffers with Lupus, a chronic and complex autoimmune condition, which causes a variety of problems including joint pain, breathing difficulties and extreme fatigue. It is incurable and Sophie requires medication and a treatment plan to control the symptoms. She also had to create her own learning plan during her A Levels to work in advance as a contingency should one of her regular flare ups occur, to make catching up less demanding. As well as being a dedicated, model student, Sophie’s experience of suffering with an invisible illness has inspired her to set up her own non-profit organisation RAiISE (Raising Awareness of Invisible Illnesses in Schools and Education). On her own initiative, she pitched the idea of RAiISE to her consultant at Alder Hey Children’s Hospital in Liverpool before gaining the support of Lupus UK to get the idea off the ground. Sophie has since sourced all the funding for RAiISE and is producing an education pack to be distributed to schools nationwide soon, and it is hoped in time, this will be done internationally too. Sophie, who is also a Patient Research Ambassador with the National Institute for Health Research, said: “I can’t believe it! I’m so happy. I was sat at the table listening to the stories of the other finalists and I was thinking ‘just being in the top three is amazing’. And then they called my name out as the winner! The feeling is brilliant. “It was a wonderful night celebrating the best in education and I had the chance to meet inspiring people who are working to get everyone the education they deserve, no matter what their personal circumstances. “I now get to visit Parliament in January which I’m really looking forward to as it is something I have wanted to do for a long time. Through her work with RAiISE, Sophie has attended various health conferences in Greece, Italy, Spain and the US, as well as the UK, to lobby influential healthcare professionals for change. Her next challenge is working towards full charity status for RAiISE. Principal of Nelson and Colne College Amanda Melton said: “I would like to congratulate Sophie on winning this fantastic award. 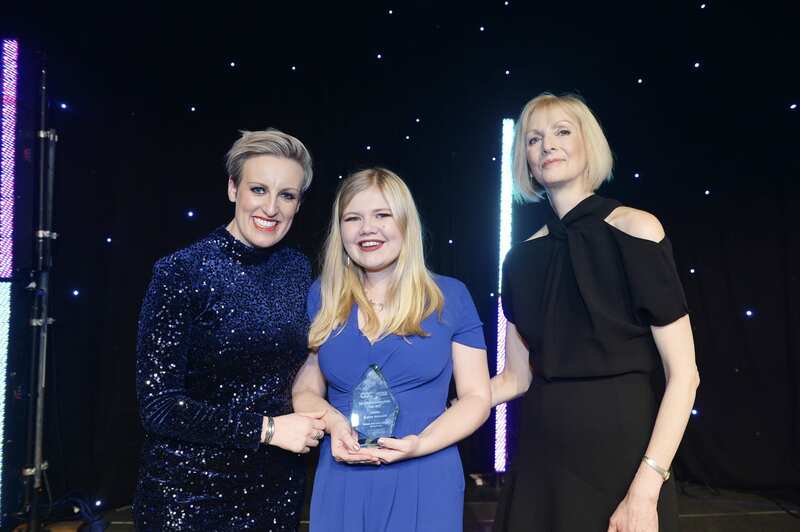 She is an outstanding individual and thoroughly deserves the prize of Young Student of the Year for both her commitment to her academic studies and for the remarkable work she is doing in raising awareness of invisible illnesses in education.